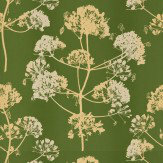 Clarissa Hulse is a British textile designer with a strong emphasis on botanical images and colour. 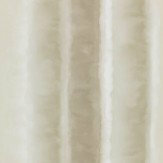 A Demeter stripe with a water colour effect showing in stone and beige. Other colour ways available. Request a sample. Paste-the-wall product. 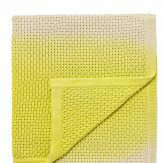 This comes as a vertical stripe off the roll but can be used horizontally. Free pattern match. 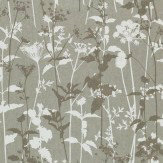 A stunning all over nettles design with metallic glitter effects - showing in gun metal grey and white on metallic silver. Other colour ways available. Please request a sample for true effects. Paste-the-wall product. 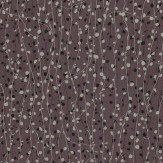 A pretty trail of beads with metallic effects - showing in metallic silver and black on a deep purple background. Other colour ways available. Please request a sample for true colour match. Paste-the-wall product. 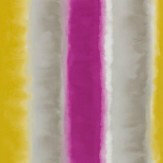 A Demeter stripe with a water colour effect showing in grey, white, purple and yellow. Other colour ways available. Request a sample. Paste-the-wall product. 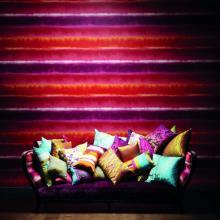 This comes as a vertical stripe off the roll but can be used horizontally. Free pattern match. 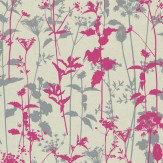 A stunning all over nettles design with metallic effects - showing in pink and grey on a off white metallic background. Other colour ways available. Please request a sample for true effects. Paste-the-wall product. 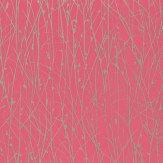 A grass design in stunning metallics which will reflect the light beautifully - showing in metallic silver on a hot pink background. Other colour ways available. Please request a sample for true colour match. Paste-the-wall product. Wide Width. 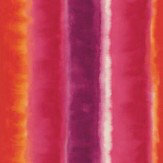 A Demeter stripe with a water colour effect showing in red, orange, purple and white. Other colour ways available. Request a sample. Paste-the-wall product. This comes as a vertical stripe off the roll but can be used horizontally. Free pattern match. Photographs taken at dusk in the Kogelberg Nature Reserve in South Africa provided the inspiration for this romantic bed linen design. After a clear day the fog rolled in creating dramatic silhouettes of the native Fynbos over a backdrop of misty peach and coral skies. Printed in a palette of inky blues and greys, Dusk will add a dramatic edge to your bedroom scheme. 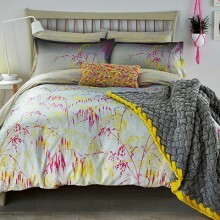 This bedding collection has duvet covers, both housewife and oxford pillowcases with a co-ordinating throw and decorative cushion. 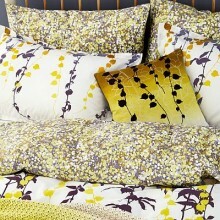 A stunning collection of duvet covers, pillowcases and co-ordinating throw and cushion by Clarissa Hulse. This unique design has been inspired by the backing cloth Clarissa uses in her studio to pin down products for hand printing, leaving behind an array of beautiful patterns and colours. 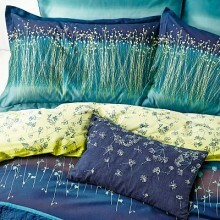 A beautiful bedding collection by Clarissa Hulse featuring a contemporary design of silhouettes of different grasses in gorgeous bright colours set against a stunning silver background. 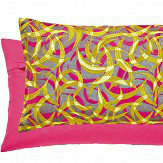 This collection includes various sizes of duvet covers, pillowcases, throw and cushion. 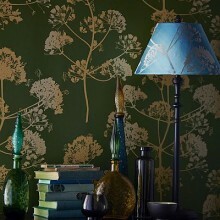 Co-ordinates with the Meadow Grass wallpaper design. 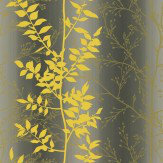 Harlequin bring us their second collaboration with the artist Clarissa Hulse with these wallpapers. 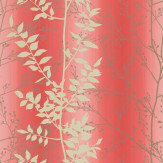 Callista by Clarissa Hulse, a glorious celebration of colour and pattern, inspired by her enduring passion for plants, flowers and landscapes coupled with her trademark use of intense colours; make this a truly contemporary mix of country and city style – perfect for those wanting to add some colour to their lives. 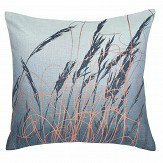 Inspired by the Wiltshire countryside in springtime. 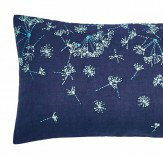 A glorious rich mix of blue and greens, with bold stripes and delicate floral detail - this bedding collection has duvet covers, both housewife and oxford pillowcases with a co-ordinating throw and decorative cushion. 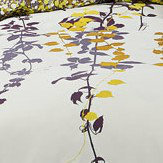 A trailing ivy design, reflecting Clarissa Hulse's trademark passion for the natural world - in a delightful combination of acid sulphur yellow and purple grey with white. 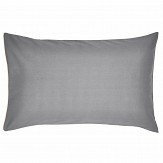 Full range of duvet cover sizes available, with co-ordinating pillowcases, throw and decorative cushion for the full effect. Clarissa Hulse has teamed up with Harlequin to produce Kallianthi, a breath taking collection of wallpapers with a botanical theme which encompsses her trademark style and distinctive handwriting. 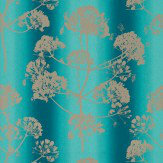 Beautiful bright and bold colouring throughout the collection, including designs of demeter stripes, nettles, grasses and many more, with metallic and glitter effects. Paste-the-wall products which makes it easy to apply and remove.